Acting as trustee for the estate of Mary W. Hopkins, Stephen L. Hopkins acquired the old, two-story wooden house at No. 81 White Street in 1881. Like all the brick and wooden dwellings in the neighborhood, it was soon to go. The Hopkins estate contracted architect Charles C. Haight to design a modern loft building in its place. Romanesque Revival had gained a sturdy foothold in architectural taste by now, greatly empowered by Henry Hobson Richardson's works, like his masterful Trinity Church in Boston. The medieval-inspired style often relied on heavy carvings, massive arches, and muscular stonework. So it is perhaps a bit surprising that Haight chose the style for the 25-foot wide plot. His solution was a pleasing toned-down version of Romanesque Revival with no carvings nor chunky medieval columns. Instead the asymmetrical red brick facade was relieved by brownstone bandcourses. 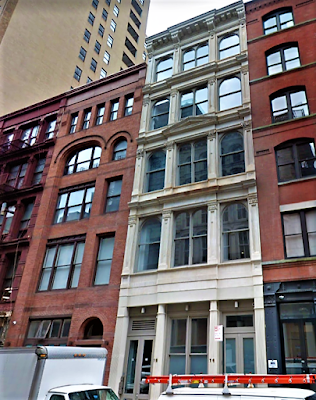 Above the ground floor where a cast iron storefront nestled within the brick, three stories of wide and narrow openings culminated in rounded windows capped with a continuous brownstone archivolt (or "eyebrow"). Haight successfully created the illusion of two three-story arches. Carved brownstone bosses dripped from the points of the archivolts, the architect's historic nod to the middle ages. Although an arcade might have been expected for the top floor--certainly in keeping with the style--Haight opted for side-by-side rectangular windows topped with a common brownstone lintel. At either side were brick corbels which originally upheld an architecturally appropriate cornice, perhaps lost in the devastating fire seven years later. Among the first tenants was Caxton Bookbinding Co. In July 1883 the firm was looking for a "good book cutter." 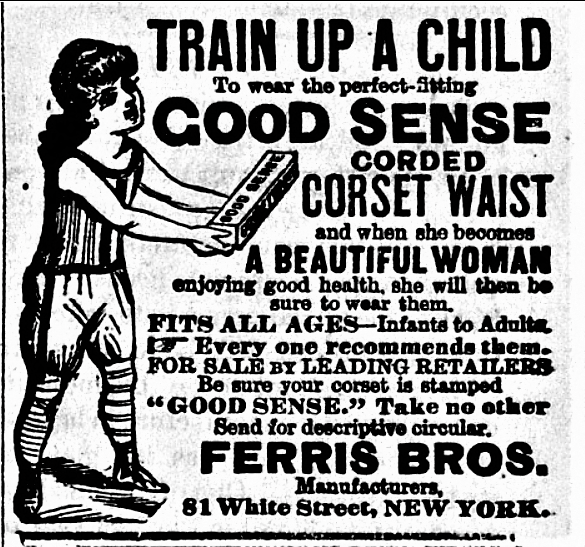 Another early firm was Ferris Bros., manufacturers of corsets. 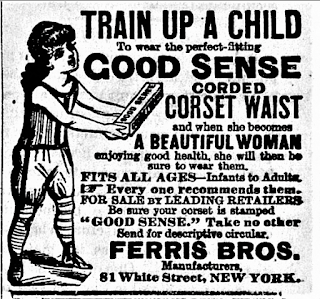 The company offered corsets for all ages of users, including (hard to believe today) infants. Caxton Bookbinding was still in the building in 1888. It shared the upper floors with three dry goods commission merchants--Posner Brothers, Mahler & Myer, and S. Lepousky. At street level was Simon & Strelitzer, cloth commission merchants. A fire broke out in the building at around 7:30 on the night of January 2. It traveled up the elevator shaft, spreading throughout the structure. An inferno resulted when it reached the bookbinding shop, with its highly flammable contents. The Sun reported "The cloths, book bindings, paste, paints, and chemicals in the Caxton book concern's rooms burned fiercely. The fire burst through the iron shutters at the rear and shot toward the houses on Franklin street." The thick smoke made White Street "absolutely dark," said the newspaper. So intense was the heat that windows of factories facing Walker Street, a block to the north, blew out. Despite the frigid winter temperatures, "the sidewalk below these buildings were so hot that dripping water turned to steam." The New York Times reported "At 10 o'clock the extent of the disaster was the gutting of 81, the seriously damaging of 79 and 83 and 85, and the gutting of the sixth floor of 82 and 84 White-street." Caxton alone suffered $35,000 in lost stock and machinery--more than $900,000 in today's dollars. Charles C. Haight was brought back to make repairs. He filed plans on March 9 with a projected cost of more than a third of a million dollars today. The renovated building was leased to J. H. Bishop "the well-known manufacturer of skin rugs and sleigh robes," as described by the Fur Trade Review on July 1, 1890. The product were a necessity for winter passengers in open sleighs. The magazine said the Wyandotte, Michigan-based firm "has fitted it up for a warehouse and salesrooms for the display of his very popular productions." An advertisement that year warned retailers "Do NOT buy your Sleigh Robes or Skin Rugs until you see our line. We are showing the largest line of 'Fur Rugs,' Sheepskin Mats and Goatskin Sleigh Robes we have ever shown." The early 1890's saw an array of factories on the upper floors. L. Livingston & Co. was here by 1893 making pocketbooks. Its large workforce included 50 men, 30 boys under 21 years of age, 15 boys under 16, 3 women, and one girl under 21 years old. Their workweek was 60 hours, not including weekends. Smaller shops at the time were Jacob Gray, makers of suspenders; and Max Ludwig who employed just 6 men and a boy making "corset steels." The Hopkins family still owned No. 81 in 1906 when Louise D. Hopkins leased it to the Raven Gloss Manufacturing Company. The firm manufactured shoe polish and introduced its Cadet White that year--reflecting a new fashion trend in footwear. On August 29, 1906 Boot and Shoe Recorder published an article entitled "Are White Shoes Being Worn by Everyone?" which began "One would think every man, woman and child in this country were wearing white canvas shoes from the enormous daily shipments of Cadet White from the factory of the Raven Gloss Company at 81 White street, New York City." The firm had long produced its Button's Raven Gloss, which the magazine described as "a shoe dressing that has become famous, and is known to every buyer of shoes, that is whose who use shoe polish, and there are very few who do not use it." In January 1919 the U. T. Hungerford Brass and Copper Co. purchased the building. Despite its name, the firm dealt in a broad array of metals, including "German silver," bronze and aluminum. 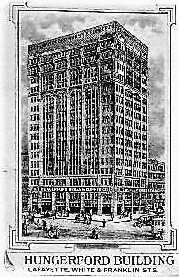 Its headquarters, the 17-story Hallenbeck-Hungerford Building facing Lafayette Street, was just 50 feet to the east. The Hungerford Building, which survives, was pictured on the firm's letterhead. 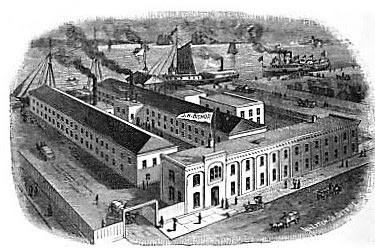 The new owners hired architect William E. Austin to improve the aging building and convert it for warehousing. His plans, filed the following month, called for replacing the stairs with new "fireproof" versions, added an elevator, and replacing doors. The renovations joined No. 81 internally with No. 79 and it was most likely at this time that the storefront was replaced with truck doors. No. 81 and its next door neighbor were joined internally in 1919. In 1927 Case Brass and Copper Company acquired the firm, including the White Street warehouse. The firm remained in the building for decades. In 1960 the combined buildings were purchased by William Abramowitz, head of the Concord Radio Corporation. The New York Times reported he intended to use the building "for his other electronic enterprises." Major change came to Nos. 79-81 in 2006 when a conversion resulted in two apartments per floor above street level. By 2012 No. 81 was home to Space on White, a performance space for emerging artists. It has since closed.